It's November and that does not usually mean fireworks. Allie McMurphy here from Mackinac Island's Historic McMurphy Inn and Fudge Shop. My writer wanted me to show off the cover for book three of the Candy Coated Mystery series out May 2015. You'll see that my bichon poo, Mal, has a new friend and the two of them are up to mischief. It's the Star Spangled Fourth celebration and a lot more than fireworks are going boom on Mackinac Island. I hope you put this on your wish list. Besides having to figure out who killed pyro-technician, Rodney Rivers, I've whipped up some favorite, pie-flavored fudges. Since November is a great time of year for friends and family and fudge I'm giving you a sneak peak of fudge recipes inside. Preheat oven to 350 degrees. Place the chopped pecans on a baking sheet and toast them in the oven for about 8 minutes, stirring halfway through. Remove from the oven and allow the pecans to cool. Prepare a 9x9-inch pan by lining it with aluminum foil. Butter the foil with 1½ teaspoon butter. Place 2 cups of dark chocolate mini chips in the bottom of the pan. In a large heavy-bottomed saucepan, combine the brown and granulated sugars, the half and half, and the corn syrup over medium heat. Stir until the sugars dissolve. Insert a candy thermometer, making sure it does not touch the bottom or sides of the pan, and bring to a boil, stirring occasionally. Allow the mixture to boil, until it reaches 238 degrees on the candy thermometer. This takes approximately 10 minutes. Once at 234-238 degrees, (soft ball stage) remove from heat. Take out the thermometer and stir in the butter, maple and vanilla extracts, and chopped pecans. Stir the fudge vigorously with a heavy wooden spoon for 10-15 minutes until the fudge loses its shine and holds its shape. Pour fudge into the prepared pan and smooth it into an even layer. Refrigerate the fudge for at least 1 hour to set it. Once set, remove the fudge from the pan using the foil as handles. Cut the fudge into small 1-inch pieces to serve. Store fudge in an airtight container at room temperature for up to one week. Oh yum, all the recipes in all the books have made me hungry, but I have to make this one! This was a huge hit with my taste test group. They were picking at the crumbs. I hope you enjoy! The recipe sounds good. We might just have to try it! Hi Kim, it's pretty easy. I hope you do give a try. Cheers! Sound yummy! And the cover is super cute! I'll look forward to its release. 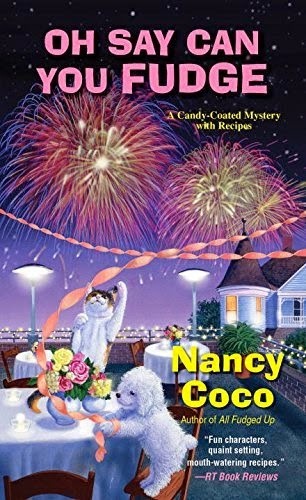 I just finished To Fudge or Not to Fudge the other week and am just about finished with Murder Gone A-Rye with Engaged in Murder waiting in the wings! Lots of fun reading in store for me in the coming weeks. Thank you for your support! I agree. I think this cover is really cute. I'm always looking for some thing new to put in my Christmas gift baskets. I just finished To Fudge or Not to Fudge, early last week. I will preorder this new book. I like this series a lot. Great sounding series, wonderful recipes and a really fun cover. I am looking forward to reading but it seems like a long wait; you tempted us so much. Geesh. Wishing you great success with this and all of your endeavors. May there be a contest to win an ARC of this book by any chance. I want to read it sooner than later. Thank you so much.